Subject: Can these minis be painted? I painted lead figures over 20 years ago, and was thinking about getting into it again. But I've never painted plastic figures. Can you paint these the same way? 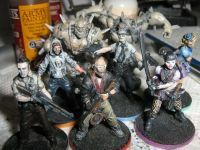 Just wash with soap the miniatures, then use a black or white coating, and you can fully paint them. I painted hundreds (thousands?) of miniatures when I played games workshop's games. The biggest lure of this game is the minis. Actually no, the plastic is in a liquid state right now and therefore paint cannot adhere to it's surface. I keep hearing lack of game play and all about the miniatures...and yes at $120 price point one expects top notch components...but, I think people would invest in the game if it were standees or meeples if the price was $30-$35...it's just a relatively straight forward hack and slash dungeon crawl with some upgrades and story/campaign...I prefer eurostyle medium to medium heavy games, but once in a while I like to take a break for something light and fun...Zombicide fills that, and Massive Darkness will certainly be a step or two beyond that in complexity. Back then, plastic miniatures were not great but you may remember that they did exist. For example, Games Workshop miniatures were all metal for figures but the vehicles were plastic. Plastic miniatures now are night and day to what they were then. They are now the industry standard over metal. Even Games Workshop figures are all plastic now. They work well for painting. Priming is important, but it always was and spray primers are very high quality these days. I've painted plenty of CMoN miniatures. There are plenty of guides online, so I won't bother duplicating that work here. When this campaign first began I read numerous comparisons between Massive Darkness and other games. The new version of Warhammer Quest was released at the beginning of the Massive Darkness campaign and drew many comparisons. In almost every thread I read people suggested that Warhammer Quest Miniatures, while fewer in number, would be much better to paint than these miniatures. Something about that sentiment struck me as wrong, but until I actually looked at the Warhammer Quest box, I couldn't really figure it out. In my opinion, these miniatures will be much, much better to pain that Warhammer Quest miniatures. I looked at the complexity and level of detail and immediately knew that, were I to paint them, the Warhammer Quest miniatures would not look very good. Given my painting skills, they would likely be a mess. And I would labor over them for weeks or months. On the other hand, I have found that CMoN miniatures take blocking colors and washing very well. I can get a reasonably nice paint job in a short time with a few simple techniques. And they come preassembled, as well. As a matter of fact, Massive Darkness reminds me a lot more of the Warhammer Quest that I owned back then than Games Workshop's latest effort. IIRC, my old WHQ miniatures were also plastic and came as single pieces that merely needed to be glued to a slottabase. And they were relatively simple to pain, as well. TL;DR. Yes these miniatures are not only good to paint, but probably ideal for someone like you, who hasn't painted in a long time. With the softer plastic, I recommend Army Painter primer. Others say Krylon/Walmart Whatever Brands work, though, I haven't tried them. They have and its called Super Fantasy: Ugly Snouts Assault but it cost more than $30 retail. Friends its no longer 1996, prices have gone up in the last twenty plus years. Even 25 years ago, while the majority was metal still, GW had several plastic figures in its line. I've painted plenty of CMoN miniatures. In my opinion, these miniatures will be much, much better to pain that Warhammer Quest miniatures. I looked at the complexity and level of detail and immediately knew that, were I to paint them, the Warhammer Quest miniatures would not look very good. Given my painting skills, they would likely be a mess. And I would labor over them for weeks or months. On the other hand, I have found that CMoN miniatures take blocking colors and washing very well. For what its worth my experience is the same. I've been painting Rum & Bones minis for a couple months now and still love them. I tend to get "bored" if I'm stuck painting intricate detail on a mini for weeks on end. These CmoN sculpts fit my bill. And yes, Army Painter primer works great on this plastic. They are really good figures. Of course there are some better ones in historical ranges but they are far better than any other board game figures I know. The plastic is very durable and takes Vallejo primer very well. Only removing the few mold lines is more work than from hard plastic figures. Please feel free to leave any feedback or send me questions about my humble work. And I would labor over them for weeks or months. Yeah, that's one thing that pics of mini's don't tell you. The pic may look fantastic (eg. Stefan's but if the mini takes more than a week to paint, the base game alone will take over a *year* before it hits the table. CMON drops up to 150 mini's on your doorstep per KS in two waves. And it's not going to be your only KS. I have so many survivors, I don't even have time to customize their bases. (Might glue some printies, though.) I can paint a miniature in three days, but that means if I back more than *one* CMON KS, I'm a year behind in my painting. They can... as easily and fun to paint as the Zombicide minis. and within 20-30 mins I was good to go.